Tribune Chronicle / Brian Yauger Olivia Perry of McDonald prepares to make a pass during the Blue Devils’ 44-23 victory over Maplewood on Thursday in Mecca. Tribune Chronicle / Brian Yauger McDonald’s Molly Howard dribbles up court during the Blue Devils’ victory over Maplewood on Thursday. 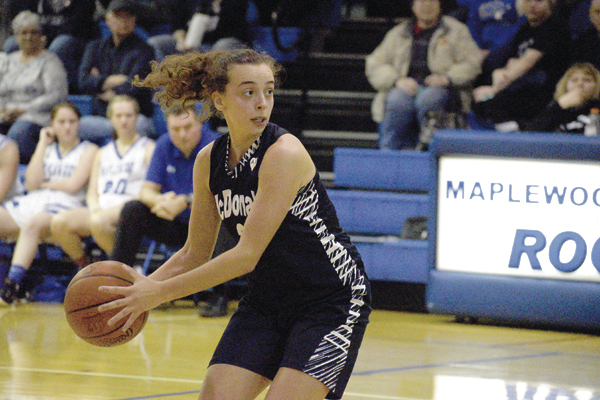 MECCA — Despite what was described as a “lackadaisical” effort from coach Amy Dolsak, the McDonald Lady Blue Devils pulled off a bounce-back win over Maplewood, winning 44-23 and snapping a three-game win streak for the Rockets. 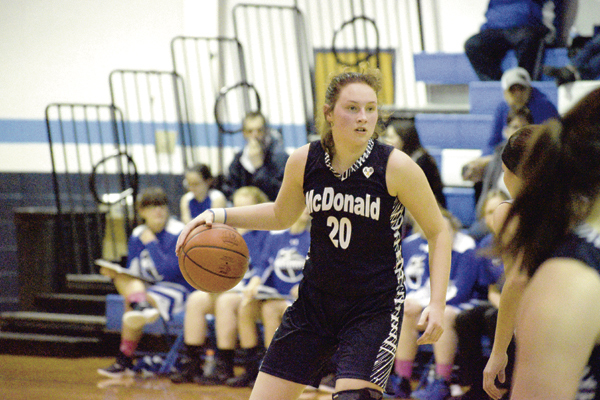 Three players scored in the double-figures for McDonald. Molly Howard led the team scoring with 14 points. Maddy Howard scored 13 and Sophia Costantino scored 12. McDonald came out in the first quarter outscoring the Rockets 9-2 and kept it rolling from there. The Blue Devils (19-1) continued to roll, scoring 13, 12 and 10 in the next three quarters as Maplewood (16-4) struggled to find any consistency on offense. Marissa Ventura led the Rockets with 12 points. Heidi Stiffler paced the Rockets by bringing down seven rebounds. The Blue Devils outrebounded Maplewood 22-17. Constantino grabbed seven boards for McDonald, leading the team. McDonald had a strong defensive showing with the Blue Devils keeping Maplewood’s scoring to less than 10 points in each quarter. Molly Howard also made three key blocks that led to great scoring opportunities. Up next for the Rockets is a NAC matchup against Pymatuning Valley. Up for the Blue Devils is a showdown with Cardinal Mooney. They end their season at Lowellville for a conference match before the tournament begins.